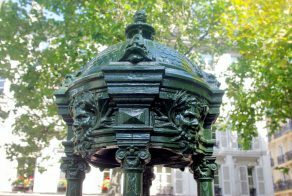 While exploring Paris, you’ve probably spotted some of the Wallace fountains. 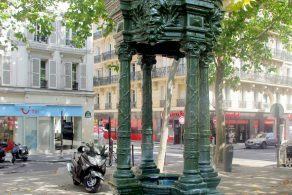 These iconic elements of street furniture in Paris are found in squares or at the angle of most-frequented streets. 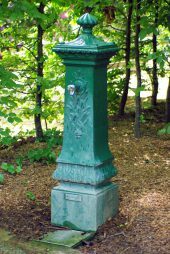 As their name indicates, the public drinking fountains bear the name of Richard Wallace, an English millionaire. As you would expect, the green fountains have a proper story to tell. I’ve researched their origins and about the different models that can be seen across the French capital. What I’ve found was very interesting. By reading these lines, I hope that next time when you see them, you get closer to have a good look at them! The fountains bear the name of a generous British philanthropist who had been residing in Paris for a long time before their introduction. 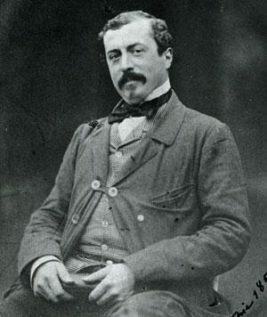 Sir Richard Wallace, 1st Baronet (21 June 1818 – 20 July 1890) was an art collector and a rich Francophile. 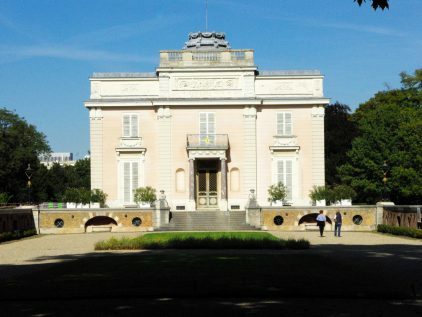 In August 1870 Wallace inherited a large fortune from his father including the beautiful domain of Bagatelle in the Bois de Boulogne. During the Franco-Prussian War (1870-71) and the Paris Commune in 1871, Wallace showed great acts of charity and generosity. By the end of the Siege of Paris he had become the most popular British citizen residing in Paris. It is estimated that by 1871 he had donated 2.5 million francs for the needy of Paris (equivalent to $6.5 million in 2010). The popular Brit received a Légion d’Honneur and a Paris boulevard was named after him (which crosses the Bois de Boulogne near Bagatelle). Lasting from 19 September 1870 to 28 January 1871 the Siege of Paris led to the capture of the French capital by the Prussian army. In March 1871 Parisian workers and members of the National Guard rebelled against the government. They founded the Paris Commune, a radical socialist and revolutionary government. The famine and poverty brought on by these tragic events had disastrous consequences. Aqueducts that supplied Paris with water had been destroyed. Consequently, the price of clean water rose dramatically. It was said that wine was then cheaper than drinkable water. Needless to say this encouraged the most poor to get drunk. 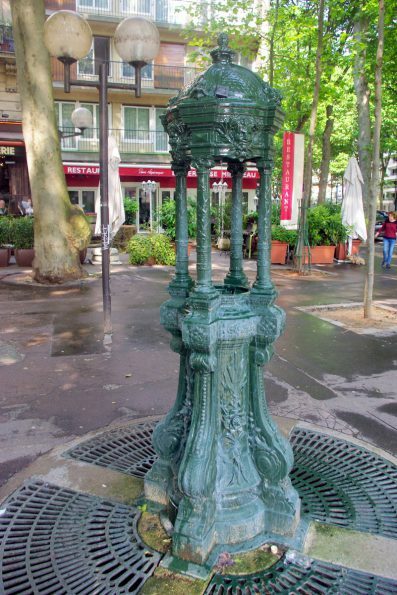 Sir Richard Wallace financed the creation of 50 drinking fountains to be set up across the City of Paris. 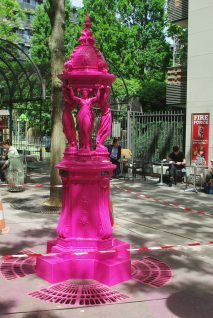 The idea was to provide all Parisians with free access to clean water. The fountains had to be practical as well as beautiful. They were made in cast iron by the Société anonyme des hauts-fourneaux et fonderies d’art du Val-d’Osne (a blast furnace corporation near Saint-Dizier, département of Marne). Cast iron was inexpensive and one of the most popular materials at the time. It made the fountains robust and suited to mass production. Height: People should be able to see them from afar. The fountains should blend into the surrounding environment which meant they should not be too tall! Form: The fountains needed to meet the need of finding drinkable water… as well as being a beautiful work of art. Price: The mass-production of cast iron fountains made them really affordable. 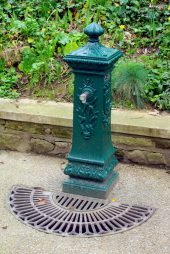 Materials: The choice of material (cast iron) meant that the fountains were solid, easy to shape, and simple to maintain. It goes without saying that the opening of the Wallace fountains was an immediate success. 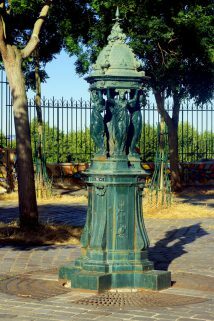 The first fountain was open to the public in August 1872 on the boulevard de la Villette. The columnists of the time related that there was much pushing and shoving in front of the fountain at its inauguration. Four years later, passers-by were still complaining of queuing too long to get a cup of water. The rich Englishman designed the model of the fountains himself. But time was short and Wallace called on Charles-Auguste Lebourg (1820-1906) to help him complete the task. The renowned sculptor from Nantes worked on Wallace’s initial sketches to design the final model. The four caryatids on the large model are due to his input. 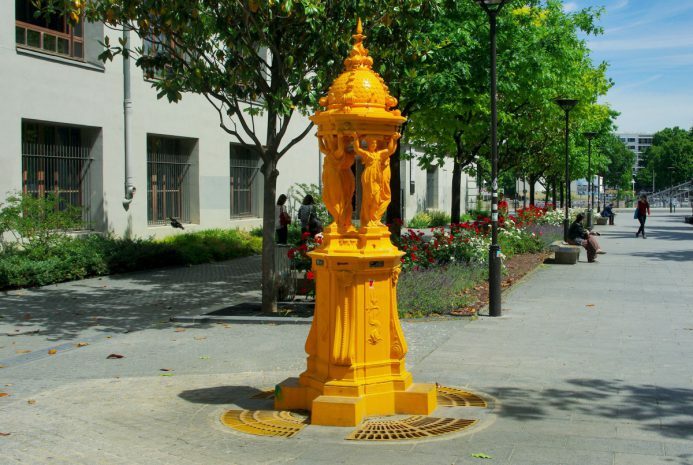 All fountains were painted in a dark green colour so as to blend in with the city’s parks and tree-lined avenues. Four models of fountains were built. Most of them can still be found in the squares and at the intersections of two streets. Armed with my camera, I went on a treasure hunt across Paris to find them all. A true piece of art! 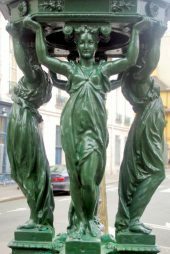 Wallace was inspired by the Fontaine des Innocents near Les Halles to design the fountain. The base of the model includes a plinth with canted corners (an angled surface which cuts of a corner) and the octogonal pedestal. 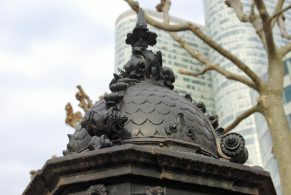 Four statues of nymphs support a scaled and pointed dome decorated by dolphins and fleurs-de-lys. A stream of water flows down from the dome to the feet of the statues into a basin protected by a grille. 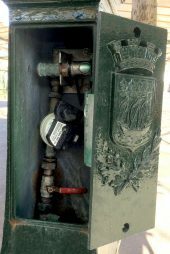 Originally the fountains were equipped with two tin-plated iron cups secured by a chain. They were removed in 1952 for reasons of public health. 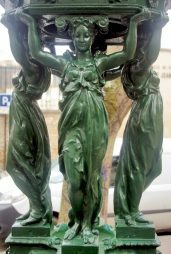 The presence of the four statues inspired the Parisians to nickname them “brasserie des quatre femmes” (Four Women’s brasserie). Have a closer look at the statues called “caryatids“. In case you don’t know what they are, a caryatid is a sculpted female figure serving as an architectural support taking the place of a column or a pillar supporting an entablature on her head. At first glance you would think they are identical. But when you observe them closely, you’ll find that they differ from each other. The position of their knees and the draping of the tunic also differ from one statue to the other. Although it looks similar to the large model, this colonnade fountain is a bit smaller. The caryatids were replaced by narrow pillars, thus reducing manufacturing costs. The dome appears less pointy too. 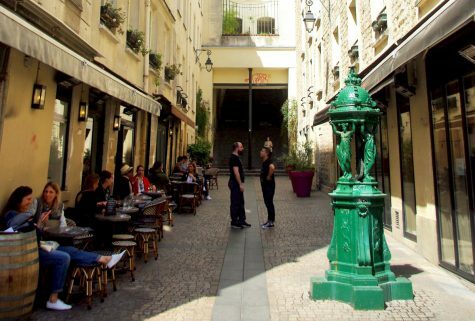 You may wander a long time in the streets of Paris before seeing one of them. There is a good reason for this: there are only two left! 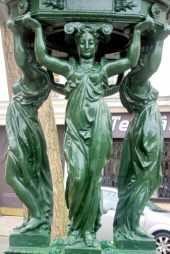 One is found on the corner of rue de Rémusat and rue Mirabeau (16th arrt) and the other place Tristan-Bernard (17th arrt). This applied model was very successful in the late 19th century. They were fixed onto the walls of buildings such as hospitals. The fountain’s basin is flanked by two pilasters decorated with tritons. It is topped by a semi-circular pediment from which the head of a naiad supplies a trickle of water. Only one copy of that fountain remains in Paris today. You’ll find it facing 59 rue Geoffroy-Saint-Hilaire in the 5th arrondissement (near the Jardin des Plantes). 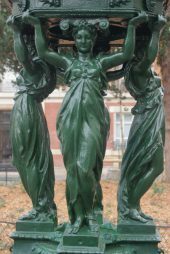 This small model is often seen at the entrance of garden squares and public gardens. 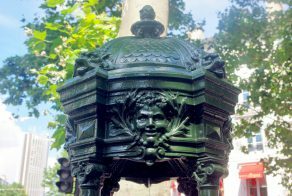 With its pushbutton faucet, it has remained until today a very popular source of water for Parisians and tourists. They are marked with the arms of Paris (except for those in the place des Invalides, the Jardin de Reuilly and the Parc de Bercy which have blank sides). Contrary to what one may think the water that flows out of the fountains is still drinkable today. They are used as a free source of water for the homeless and the needy. To see them work, visit Paris between mid-March to mid-November. The water is cut during the months of Winter to avoid any risk of freezing – this would damage the internal plumbing. 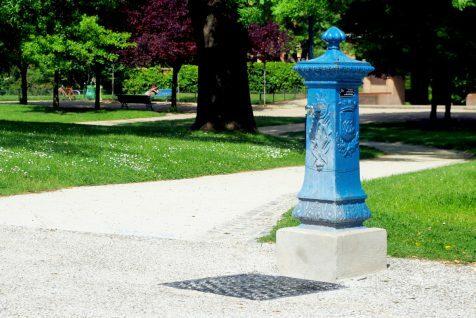 Also, the wall-fitting fountain in the Parc de la Butte du Chapeau Rouge (19th arrondissement) is blue. From Paris to France and beyond! Rio de Janeiro, Brazil (Praça Dom Romualdo, Parque da Cidade, Alto da Boa Vista). 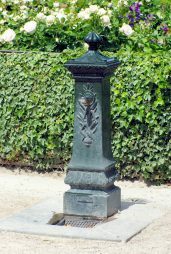 Memorial Drinking Fountains: The Wallace Fountains, France. Read more. Wikipedia: Wallace fountain. Read more. The map of all the fountains of Paris (including the Wallace fountains) on the site of Eau-de-Paris.fr. What a fantastic, well researched article. Thank you. Thank you Pierre. We visit France often and read everything we find to learn more. It is true that we know more about most of France than our friends who were born there & have lived there all their lives! It is thanks to information such as yours. Merci!